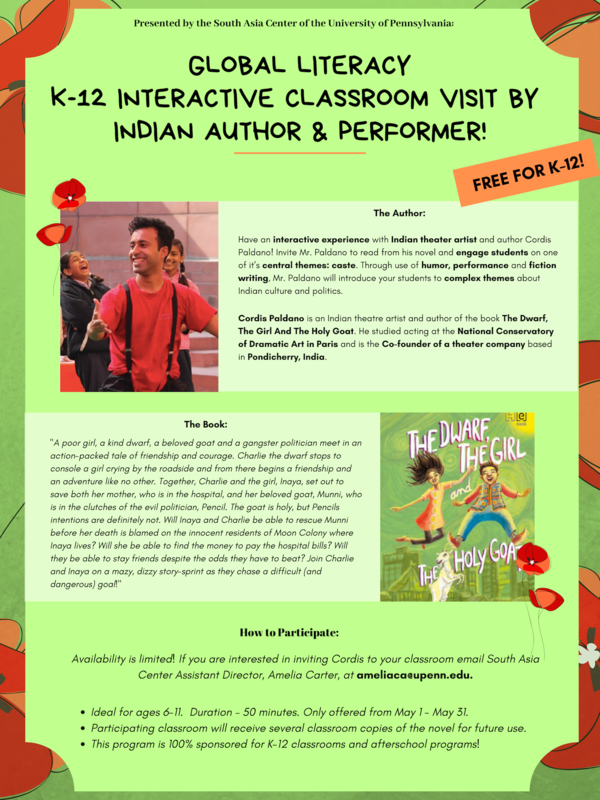 Global Literacy K-12 Interactive Classroom Visit by Indian Author & Performer! Have an interactive experience with Indian theater artist and author Cordis Paldano! Invite Mr. Paldano to read from his novel and engage students on one of it’s central themes: caste. Through use of humor, performance and fiction writing, Mr. Paldano will introduce your students to complex themes about Indian culture and politics. Cordis Paldano is an Indian theatre artist and author of the book The Dwarf, The Girl And The Holy Goat. He studied acting at the National Conservatory of Dramatic Art in Paris and is the Co-founder of a theater company based in Pondicherry, India. "A poor girl, a kind dwarf, a beloved goat and a gangster politician meet in an action-packed tale of friendship and courage. Charlie the dwarf stops to console a girl crying by the roadside and from there begins a friendship and an adventure like no other. Together, Charlie and the girl, Inaya, set out to save both her mother, who is in the hospital, and her beloved goat, Munni, who is in the clutches of the evil politician, Pencil. The goat is holy, but Pencils intentions are definitely not. Will Inaya and Charlie be able to rescue Munni before her death is blamed on the innocent residents of Moon Colony where Inaya lives? Will she be able to find the money to pay the hospital bills? Will they be able to stay friends despite the odds they have to beat? Join Charlie and Inaya on a mazy, dizzy story-sprint as they chase a difficult (and dangerous) goal!" Availability is limited! If you are interested in inviting Cordis to your classroom email South Asia Center Assistant Director, Amelia Carter, at ameliaca@upenn.edu. Ideal for ages 6-11. Duration – 50 minutes. Only offered from May 1 - May 31. Participating classroom will receive several classroom copies of the novel for future use. This program is 100% sponsored for K-12 classrooms and afterschool programs!